Welcome to the New PlantRight Website! A website, like any landscaped area, requires good design and continued maintenance, and there may come a time when you need to start over. 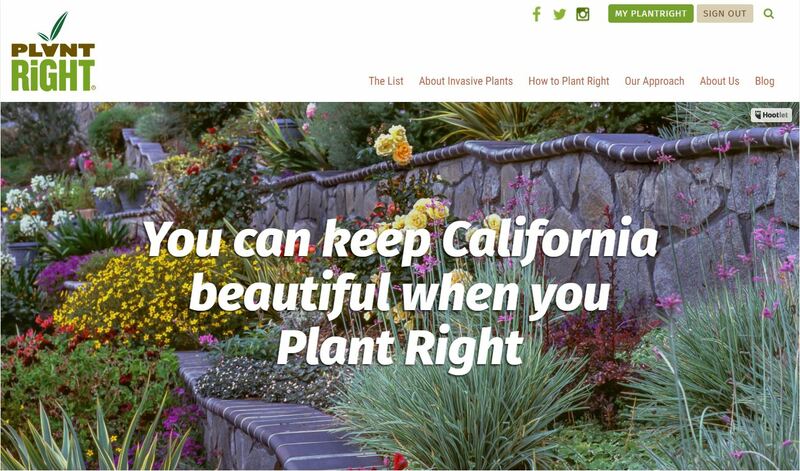 That’s pretty much what we’ve done with the PlantRight website, which now has even more information to help Californians plant right, and some great new features. Our new website uses responsive design, so if you are looking at it on a computer and make the window smaller, the words and images will shrink to fit the window size instead of getting cut off. The site looks good on a screen of any size, including tablets and mobile phones. No need to zoom in and out or try to read tiny font. We’ve added even more alternatives to the invasive plants on our list, and each alternative now has its own page with multiple photos of the plant and links to more information. 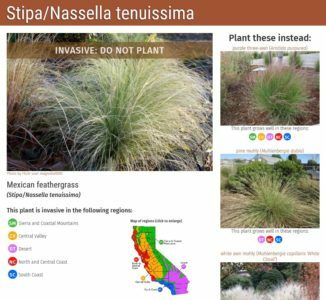 You can learn about the plants on our invasive list, like Mexican feathergrass, and compare the invasive plants side-by-side with our suggested alternatives. We will continue to add more non-invasive alternative plants and welcome recommendations for readily available, beautiful alternatives that could convince someone to use it instead of an invasive plant. If you aren’t looking for an alternative for a specific invasive plant, you’re in luck, because we’ve compiled all of our non-invasive alternatives onto one page. 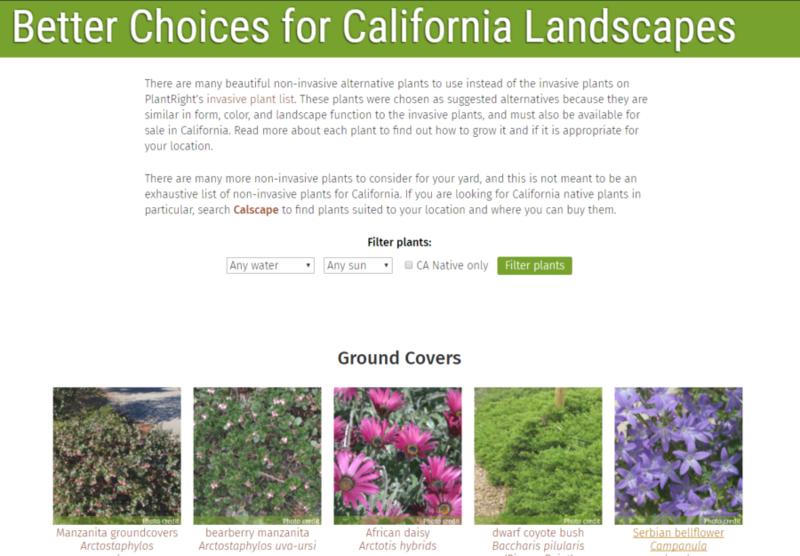 The plants on this page are grouped by growth type (groundcover, grass, perennial, shrub, tree, and aquatic) and can be filtered by sun and water needs, and for California native plants. If you have more alternative plants to suggest, let us know! If you have photos we can use of the plant, even better. If you are curious about a plant and want to know if we recommend or evaluated it, click the magnifying glass in the top right corner and enter the name. What about those other plants? There are many plants we’ve considered over the years but did not meet all of the criteria for addition to the invasive plant list. We call these the Plants to Watch. The page for each plant includes a description, information about where they are invasive or of concern in California, its Cal-IPC Inventory listing and Plant Risk Evaluator (PRE) score if applicable, and why it isn’t on our invasive plant list. We still have our Continuing Education program and encourage anyone interested to participate. If you have already completed the program, or would just like some educational resources, we’ve put our materials plus links to other resources all on one page. We will continue to update this page as we create and compile more resources. With landscape design and website design, working with a professional can make all the difference. To help you find a landscape designer, the Association of Professional Landscape Designers (APLD) has a Find Designer page. This website re-design not have been possible without the amazing web design and development work by Carina of Fila Design. Enjoy our new website, and contact us if you have suggestions or questions.